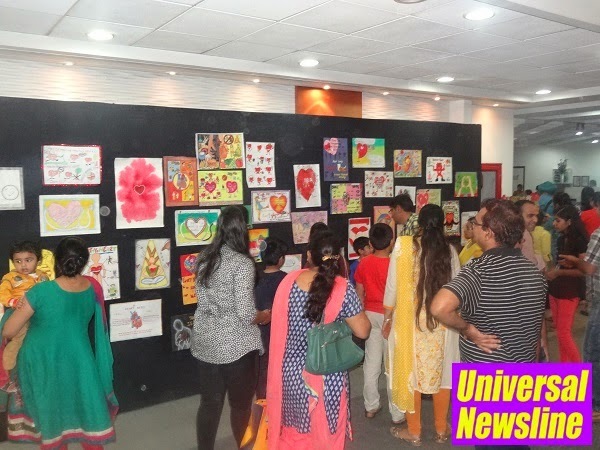 Gurgaon, Oct 12, 2014: Columbia Asia Hospitals, Gurgaon today concluded its creative campaign to generate awareness about heart healthy lifestyles, with a colorful exhibition of paintings submitted by people from across the city on the theme of cardiovascular health. “Art for Heart”, was a unique campaign initiated by the Hospital ahead of World Heart Day to encourage people with a penchant for the brush to draw a piece of art that stimulates thinking and awareness about heart health. With the hospital receiving scores of entries of drawings, paintings, and sketches on the ‘art theme’ 'Keeping your Heart Healthy', its premises will play host to as many as 80 of the best selected art works among them. The exhibition held today displayed 200 paintings submitted by the people, from which a panel of five judges selected the best art-works. On the exhibition day, the hospital also held an in-house programme that included a ‘Heart Talk’ a by senior cardiologist, an Active Lifestyle Workshop, a Healthy Cooking Workshop, as well as a workshop on Basic Life Saving Skills. Basic Life Saving Skills include techniques of emergency response to revive victims of heart attack, strokes or accidents with measures like Cardio Pulmonary Resuscitation (CPR). Cardiovascular disease has emerged as one of the leading causes of deaths in India in recent years. As Indians adopt unhealthy western lifestyles, with increasing intake of saturated fat, dependence on tobacco and alcohol, and absence of physical activity, the number of cardiac patients is set to grow dramatically. According to a study supported by ASSOCHAM in 2010, India was projected to lose USD 236.6 billion because of heart disease, stroke, and diabetes, in the decade between 2005 and 2015. Columbia Asia Hospitals, Gurgaon launched this uniquely creative campaign to exhort people to pay attention to their heart this World Heart Day, which was on September 29. The aim of this elaborate campaign was to draw people’s attention to the growing threat of cardiovascular diseases in India, and their early onset in young people due to lifestyle falws.